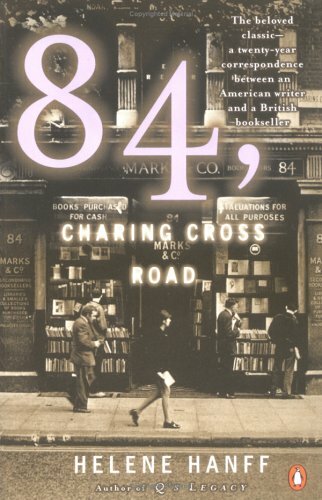 84, Charing Cross Road is a collection of letters between Helene Hanff and a group of people in London. The bulk of the letters are to Frank Doel, one of the proprietors of the bookshop at that address. However, there are letters to other employees at the shop, plus members of Frank’s family as well. The letters start in October 1949 and go through October 1969. When I received this book, it was a lot shorter than I expected. I’d only discovered recently that it was nonfiction rather than fiction, and that it was in epistolary format. I admit, at first I wasn’t thrilled with the book when I began to read it. I kept forgetting to look at the dates, so time would pass more quickly than I’d realized and I’d have to go back. Plus, I really didn’t understand Helene’s voice. She came across as brash and strange to me, the worst sort of American. Towards the middle, however, I realized it was a joking voice, and that I’d been taking her too seriously. Once again, I’m sure this was a problem with me reading so fast during readathon. This is a book I definitely want to revisit, though I probably wouldn’t have except for the end. Spoilers going forward, so please skip if you don’t want to know. The reason this book really struck a chord with me instead of being forgettable was the abrupt end to it. Somehow, though I hadn’t thought I’d cared much about these people at all – I hadn’t gotten to know them well enough through letters – when the sudden letter came that Frank had died, I had a jolt of tears come to my eyes. I hadn’t realized their correspondence stopped because of death! I should have, but I didn’t. For twenty years, these two people wrote back and forth, never meeting, never talking about much other than books, and yet they formed this longterm friendship that devastated me with its end. I hadn’t realized how powerful the book was. It crept up on me. I want to go back and read this more slowly, paying more attention to the dates and the side characters that only got a letter or two dedicated to them. I want to understand more about these lives. This entry was posted in 2009, Adult, Prose and tagged nonfiction, readathon. Bookmark the permalink.